The 'bubble cars' were a Western Region phenomena, and found new roles on the railway when relegated from passenger service. Parcels traffic was an obvious use, but they also were modified to provide Sandite to the rails in slippery conditions - a clutch surviving at Aylesbury until very recently. I commuted in a 'bubble car' when I lived in West Ruislip and worked in Brentford, for a time commuting on the Greenford branch, complete with WR lower quadrant signals. 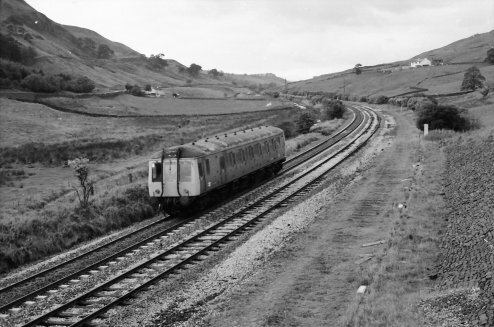 Some were modified as route leaning vehicles, as in this example heading for Copy Pit and Burnley on 24 September 1984. The Up goods loop towards Portsmouth has been lifted, as is apparent from the raked-up ballast of the old track bed. This photo was taken from the access road to Dean Farm Cottage, with the main road running along the hillside in the distance. Jubilee 45739 'Ulster' nears the summit with the 08.05 Castleford - Blackpool North excursion on 23 July 1966. 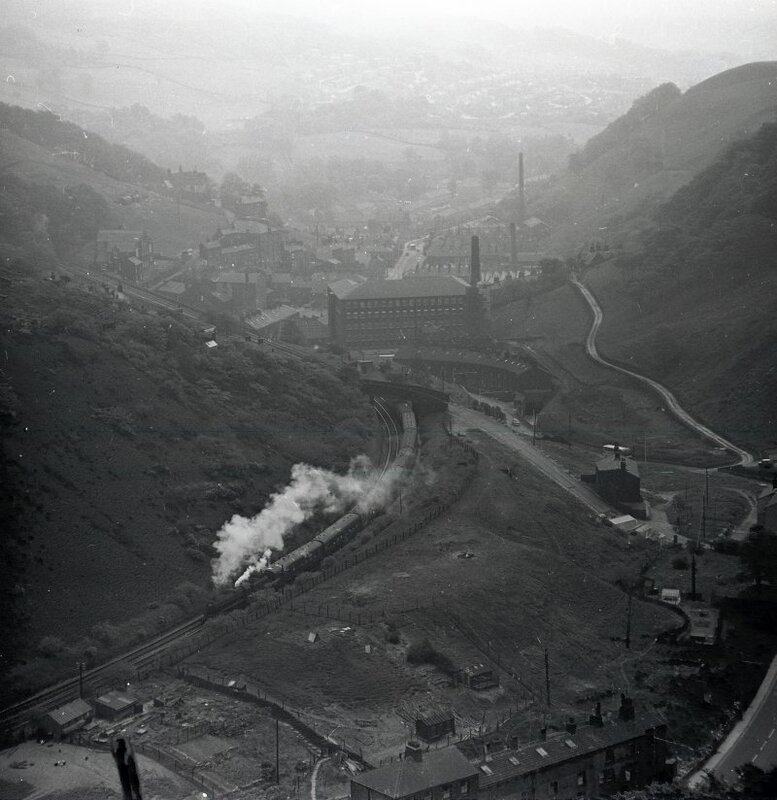 The photo is taken from the road bridge and shows the start of the Todmorden-bound loop heading towards Portsmouth. Stanier Jubilee 45647 'Sturdee' approaches the summit at Copy Pit with 1X04 Leeds City - Blackpool North at 10.20 a.m. on 30 August 1965.
ex-LMS Stanier Jubilee 45729 'Furious' heads a returning special back from Blackpool. The loop is already out of use, with the rails rusty and weeds starting to appear. 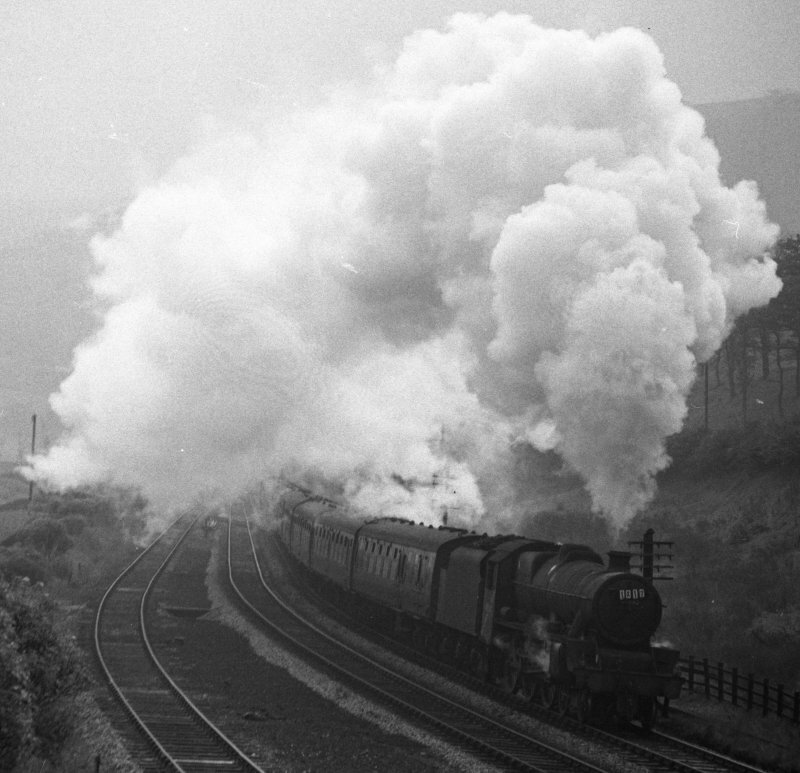 Stanier Jubilee 45562 approaching Copy Pit summit on 2 October 1965 with a Leeds + Bradford – Blackpool excursion. 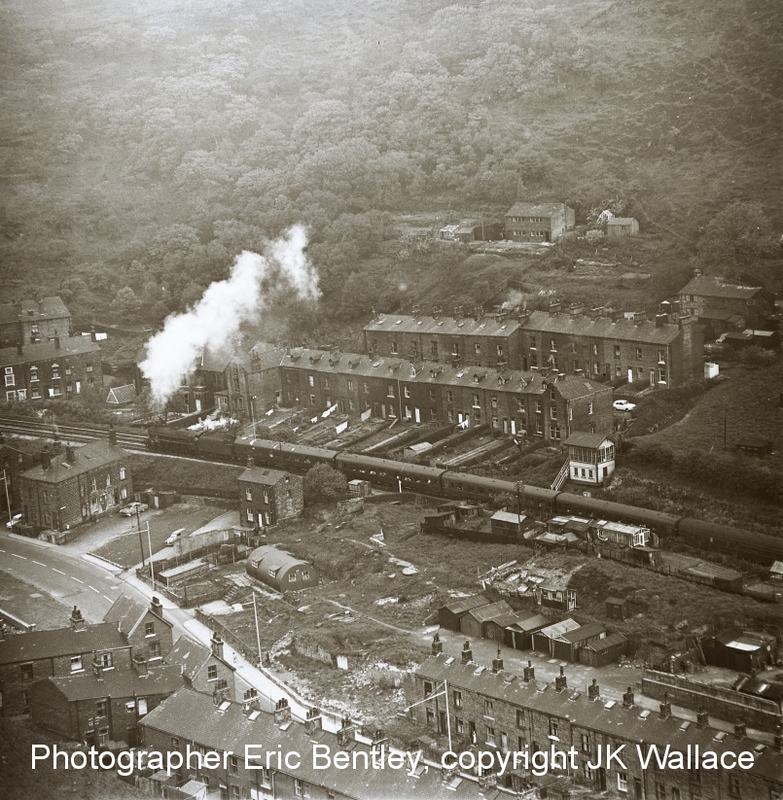 Eric's notes suggest he caught the Leeds portion of this train arriving at Sowerby Bridge. 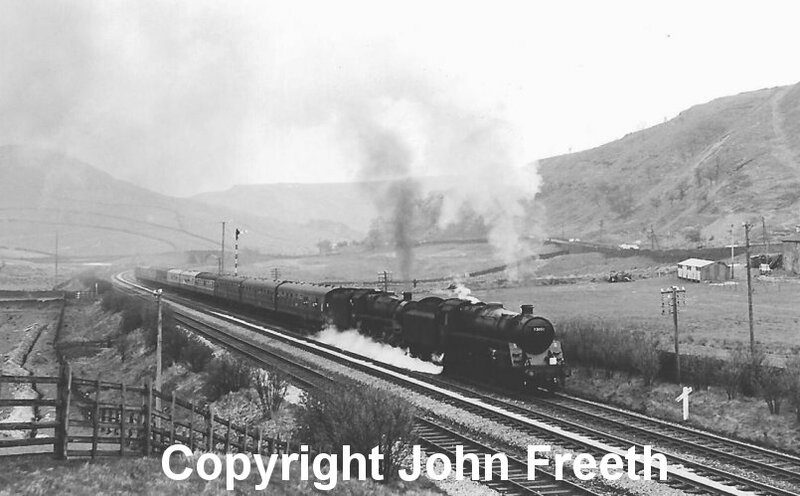 Stanier Jubilee 45562 approaching Copy Pit summit with an 8F banker on 2 October 1965. 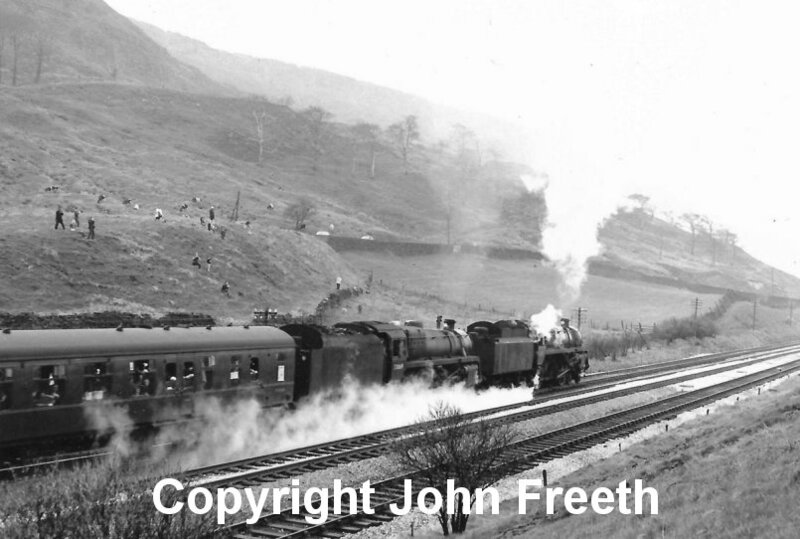 Standard 5s 73050 and 73069 approach the summit of Copy Pit on Saturday 27 April, 1968 with 1Z77 Manchester Rail Travel Society/Severn Valley Railway Society North West Steam railtour from Birmingham. 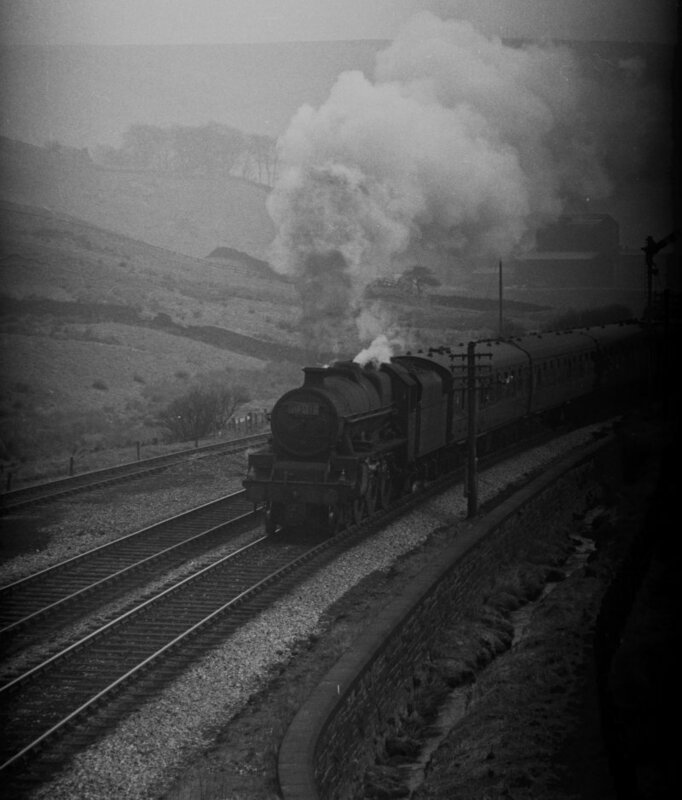 Another form of classic motive power that passed through Hall Royd were the early main-line diesel classes, particularly on excursions, when they were called to work trains over Copy Pit to Blackpool. By way of illustration, here is D347 returning to the Eastern Region with excursion 1E64 on 25 August 1973 at Portsmouth. Excursions using this route could also go to Southport, by-passing Preston using a series of junctions to arrive on the Preston-Southport line, and so make their way into the resort from the north through the suburbs of Crossens, Churchtown and Hesketh Park. However, the line closed in 1964, and so did not see any diesel classes. 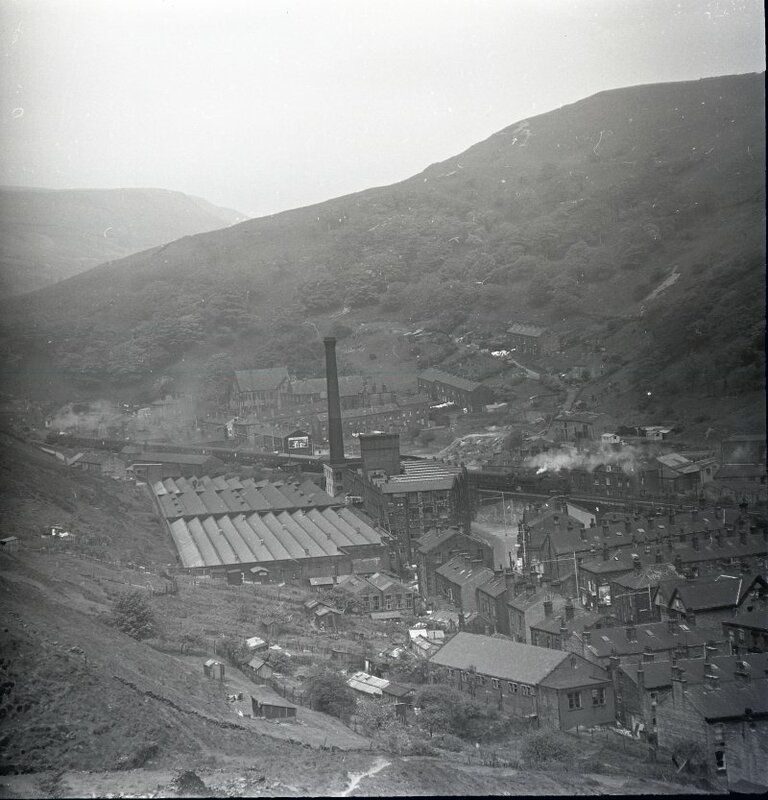 The Up Loop, which is started at Copy Pit, terminated approximately to the right of the sixth coach, this photo being taken after the Up loop, and up and down sidings had been removed. The only remaining pointwork at this time is the cross-over, as seen in the photo. Google Streetview has visited Portsmouth, and the camera has been 'set' to replicate the view of the Class 40. As can be seen, the site of the industrial units has been cleared, and a new housing estate has sprung up. Rotating the Google camera through 180 degrees shows the new access road heading towards the level crossing and the site of Portsmouth Station and signal box. Portsmouth (Lancashire) signal box diagram August 1969 - October 1973. The diagram appears to be a fresh drawing for the period that the various up sidings/headshunt (which were an extension of the Up loop from Copy Pit) and the goods yard on the down side had been removed, and Cornhill box had closed (1) on 27 July 1969. It would have been valid until the box was downgraded to Level Crossing Frame status when Preston Signal Box took control of the line on 21 October 1973. The box was abolished completely 14 September 1975. Crucially, the two boxes named on the diagram, namely Copy Pit Sidings and Stansfield Hall Junction also closed on 21 October 1973. Another Eric F Bentley classic with a Rose Grove 8F-hauled and banked mineral train passing Portsmouth Lancs on the climb to Copy Pit summit on Saturday 30 July 1966. One or two of Norman Jowett's trailers are parked in the yard, with the Emu wool one bottom left. Ex-LMS Jubilee 45585 'Hyderabad' runs through Portsmouth station on the Copy Pit line with an excursion train in the 1960s, assumed to be to Blackpool bound and heading out of Yorkshire. 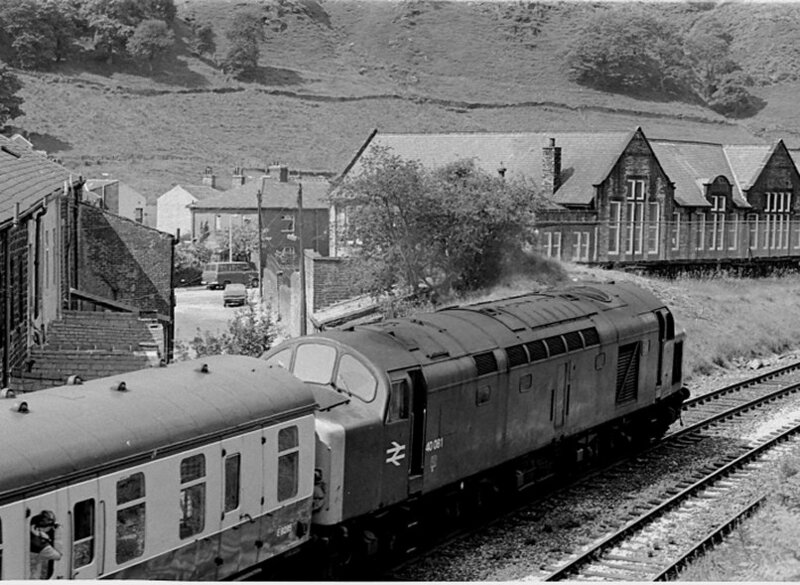 Class 40 40081 at Cornholme School timed at 09.28 with the 1M89 Sheffield-Blackpool timetabled service on 3 July 1982. Peter Rogers writes: That is one of my friends leaning out of the front window, and I think I was at the window behind...Booked for a Tinsley class 37, but producing (in my view) superior power on this occasion." Down the line from Copy Pit was Cornholme. The bankers would be well in their stride at this point, and one very special banking duty was the Alan Pegler inspired visitor in 1961 of Gresley A4 Pacific 'Mallard' which allegedly took its train over Copy Pit unaided. 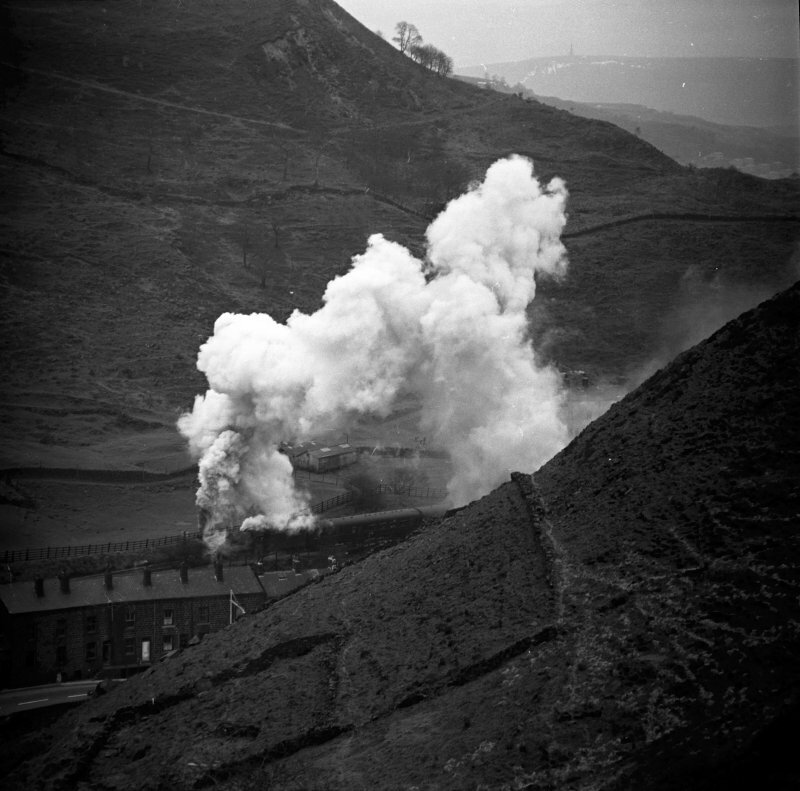 However, details of the 'Mallard'-hauled 'Northern Rubber' special and the photographic evidence of the banker at Cornholme buffered-up to the ex-Devon Belle Observation Car has only recently emerged. Here is the evidence that 'Mallard' did not leave the banker standing! There is a companion shot of 'Mallard', which we were unable to acquire, which does not show a locomotive that looks as if it's going to accelerate away from the banker anytime soon. A full log and further details of this special are on the SixBells Junction Website. 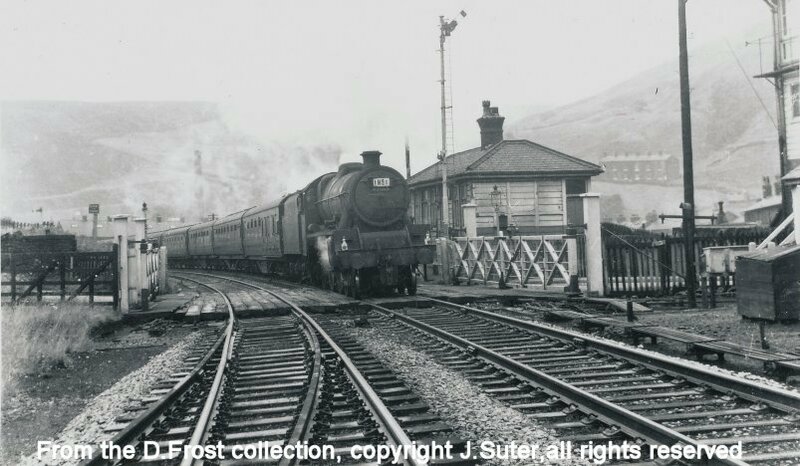 1X38 Ravensthorpe Central W M C excursion Dewsbury Well Rd – Blackpool North psssing Cornholme signal box at 10.05 on Saturday 4 June 1966. Stanier Jubilee 45694 'Bellerophon' is heading towards Blackpool on a Summer Saturday in 1966. 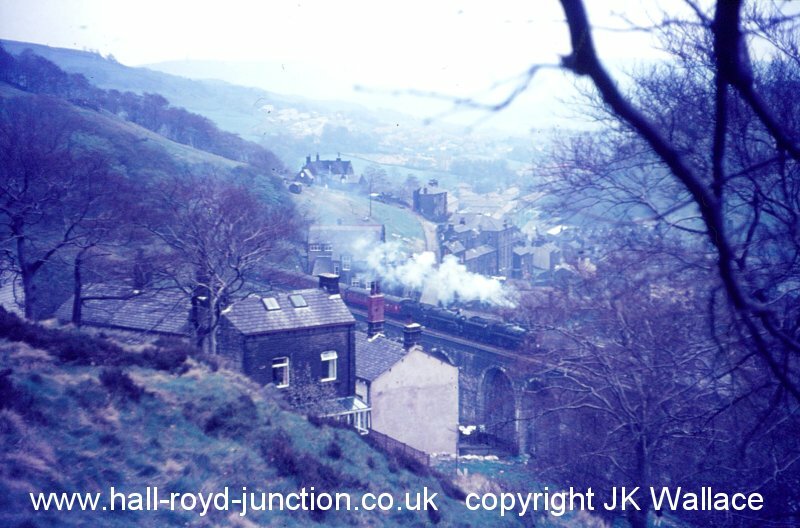 Jubilee 45739 'Ulster' heading away from Todmorden and Stansfield Hall Junction up the Cliviger Gorge towards Copy Pit and Burnley in 1966 with excursion 1M07. 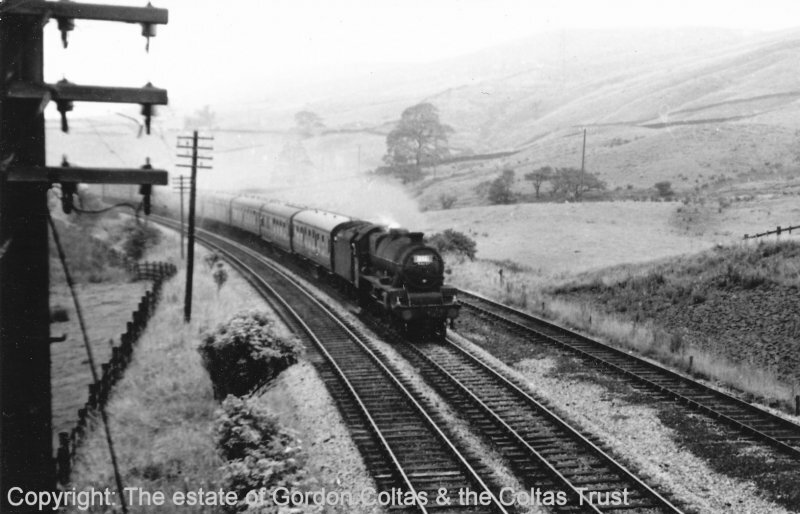 Eric notes that the westbound mixed freight train is hauled by 90345, having picked up the banker at Stansfield Hall, and seen here approaching Cornholme on Saturday 30 July 1966. Black Five 44949 and Standard 5 73069 double head 1L66 the Warwickshire Railway Society "North Western Steam Tour" from Coventry, near Lydgate Viaduct on the climb to Copy Pit, on Saturday 18 May 1968. 45208 on 1X43 Bradford S.S.excursion, Bradford Exchange – Southport Chapel Street passing Cornholme at 10.20 a.m. on Saturday 4 June 1966. 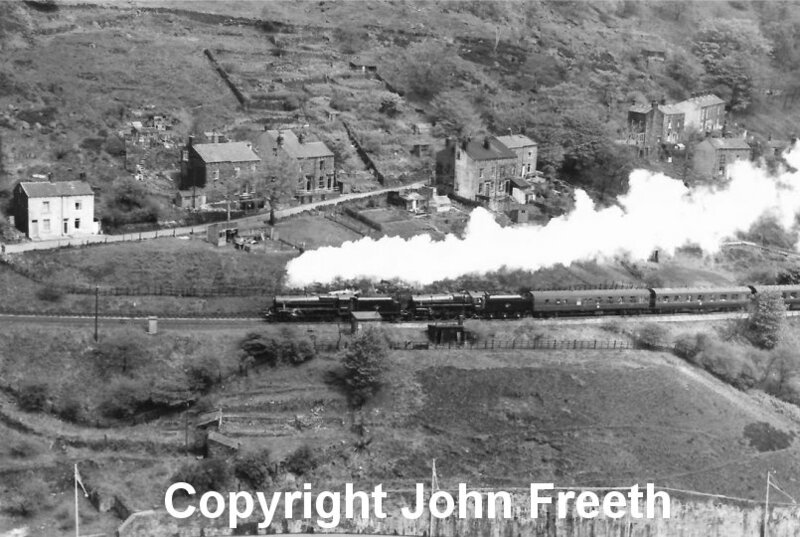 Stanier Jubilee 45694 (56A) 'Bellerophon' passing Cornholme between Todmorden and Copy Pit with 1X19 Castleford Central – Blackpool North Excursion 10.00 Easter Monday 11 April 1966. 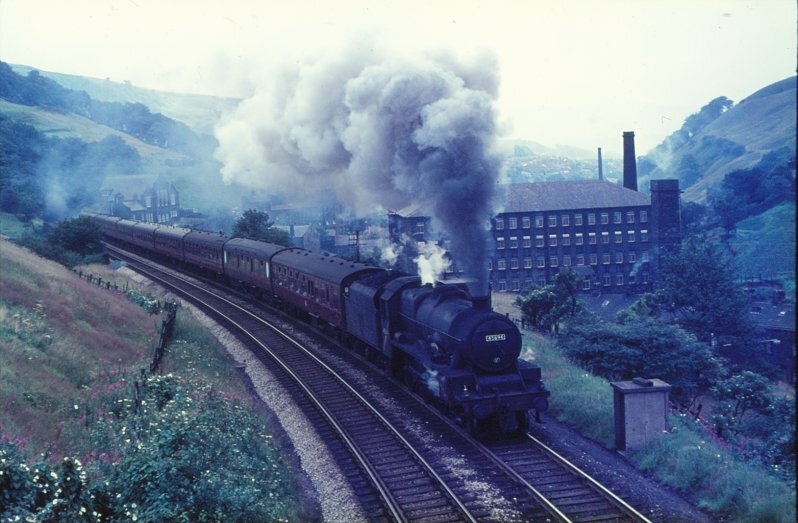 Ravensthorpe Central W.M.C excursion Dewsbury – Blackpool, near Cornholme at 10.05 a.m. on Saturday 4 June 1966. 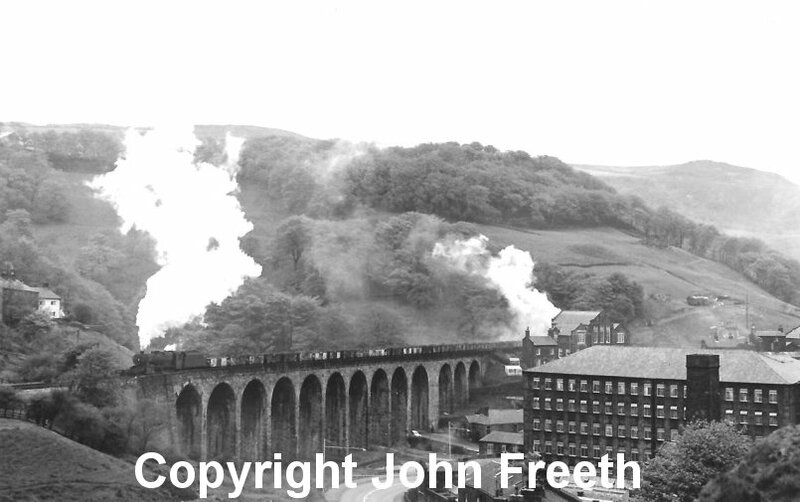 Lydgate Viaduct with 44871 and 44894 with one of the Last Day of Steam excursions on 4 August 1966. 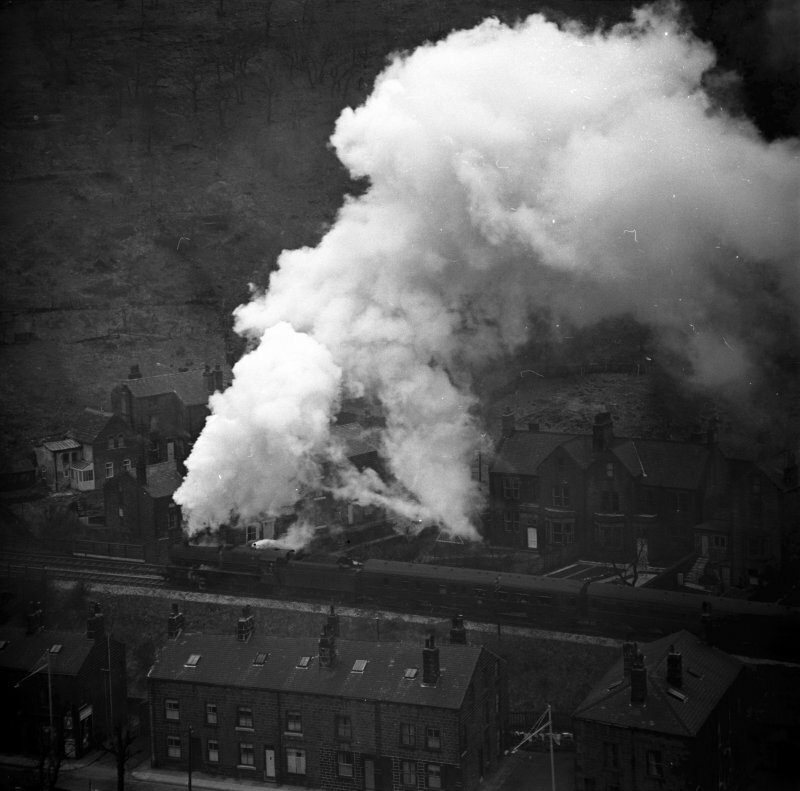 According to the Six Bells Website, this is 1Z78, the Manchester Victoria – Diggle – Huddersfield – Sowerby Bridge – Copy Pit – Blackburn – (via Bolton avoiding line) – Wigan Wallgate – Kirkby – Bootle – Stanley – Rainhill – Barton Moss – Manchester Victoria – Droylesden – Stockport leg of the Stephenson Locomotive Society (Midland Area) Farewell to Steam No.1. The train - like many of the excursions run on this particular day - ran approximately 40 minutes late. 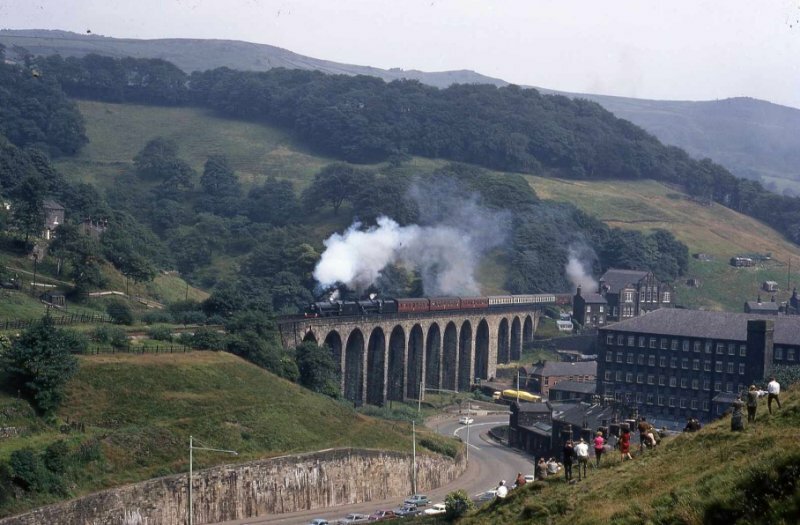 Seconds later, and from a virtually identical viewpoint, on Sunday 4 August, 1968, John Freeth also snapped Black Fives 44894 and 44871 (now preserved) double headed 1Z78, the SLS Railtour from Birmingham to mark the end of steam on British Rail the previous day, over Lydgate Viaduct. 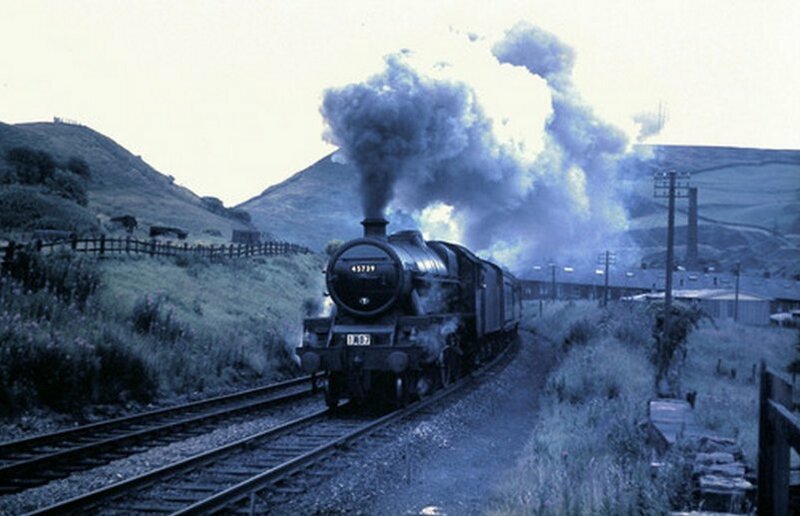 Two BR Standard Class 5 work a End of Steam excursion towards Copy Pit in 1968. Using the Six Bells Junction Website, this is thought to be the Manchester Rail Travel Society / Severn Valley Railway Society 'North West Tour' (1Z77) which started and finished at Birmingham New Street on 27th April 1968. The locos are 73050 and 73069, which were responsible for the Stalybridge - Huddersfield - Brighouse - Hebden Bridge - Rose Grove - Blackburn - Bolton leg of the tour. This was the second 'North West Tour', the first (also 1Z77) having run a week earlier hauled by 73134 & 73069. However, this earlier train is easily identified as the second and third carriages were out-shopped in the then new blue & grey passenger stock livery. 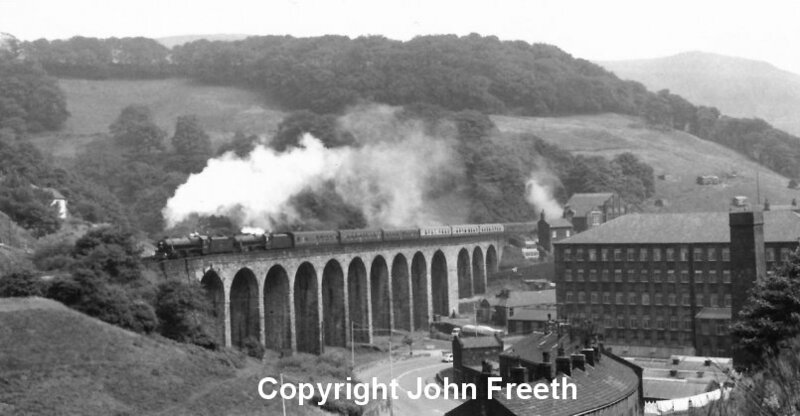 Black Five 44949 and Standard 5 73069 climb towards Copy Pit over Lydgate Viaduct with The Warwickshire Railway Society "North Western Steam Tour" from Coventry on Saturday 18 May 1968. 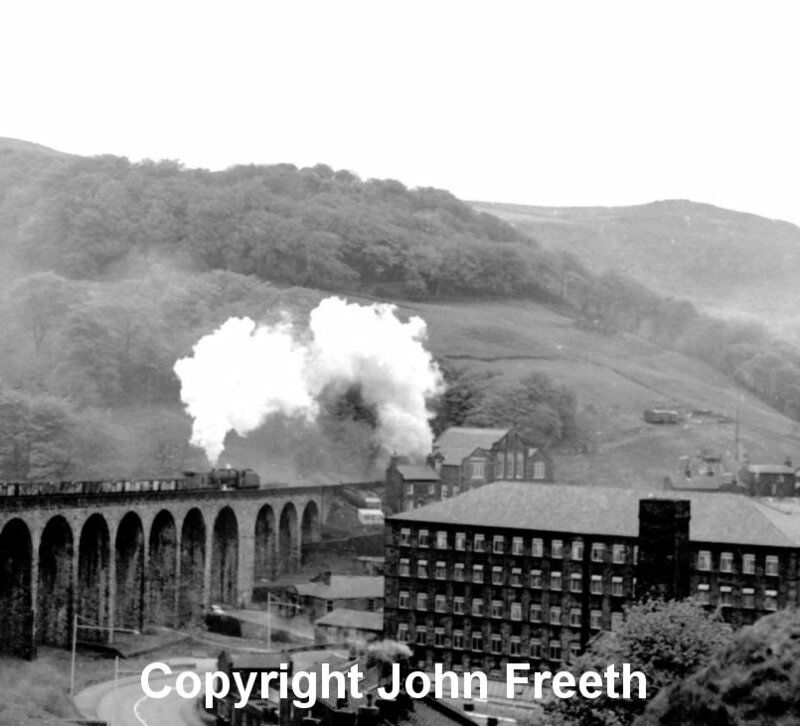 Stanier 8F 48410 crosses over Lydgate Viaduct on the climb to Copy Pit with the 9.00 Healey Mills to Rose Grove coal train on Saturday 18 May, 1968. The train was banked by 8F 48519. 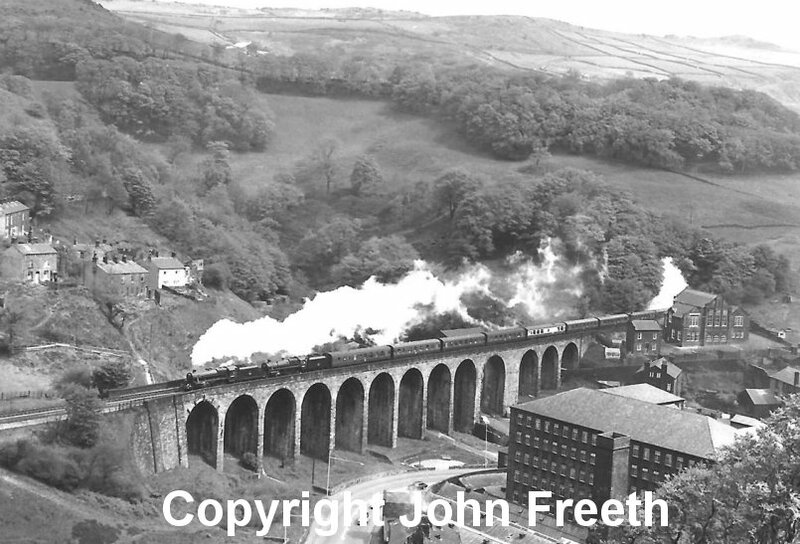 8F 48519 banks the 9.00 Healey Mills to Rose Grove coal train over Lydgate Viaduct on the climb to Copy Pit summit on Saturday 18 May, 1968. The train engine was 8F 48410. The other DMU class that regularly visited Todmorden were the Cravens sets based at Accrington. Two variants made regular appearances, the most obvious differentiator being the headcode box and destination blind. Thankfully both regularly worked to Todmorden, as the Bachmann model is of the earlier variant with destination blind above the cab windows, and the two-character headcode box below. 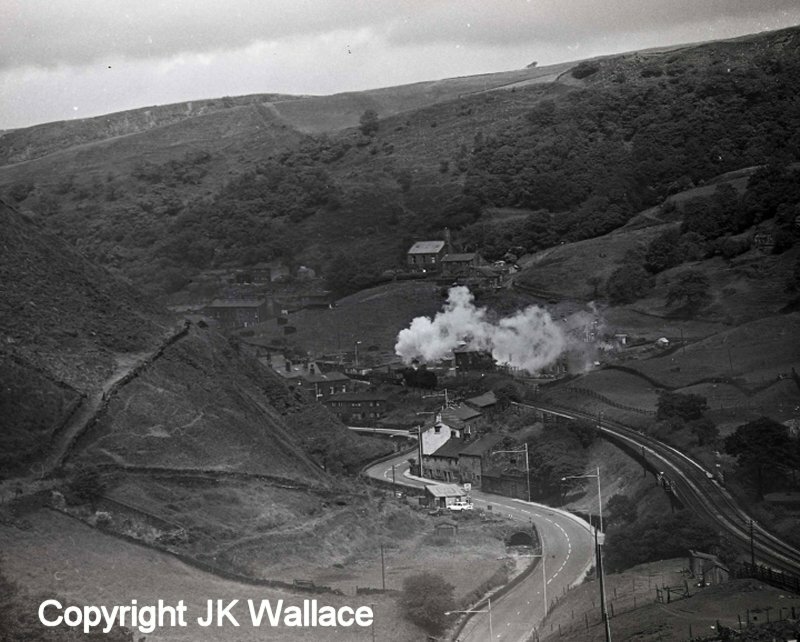 Here a two-car power-twin of the Bachmann species motors gently down hill at Cross Lee Bridge (approximately 0.8 mile from Stansfield Hall Junction box) on 26 July 1963 on its way from Burnley and Copy Pit to Todmorden and Platform 1, where this service will terminate. The unit will then backed out of Todmorden Platform 1 on the Up line, and cross over to the Down line, where it will then reverse over the single slip on the Up line and so into the Bay Platform to form the return service. The view today (2012) has hardly changed, except now there is strong tree growth on the embankment to the left of the tracks. The modern view can be checked on Google Satellite view. The bridge in the background (under which the Cravens unit has passed) is an occupational bridge connecting fields above and below the line. 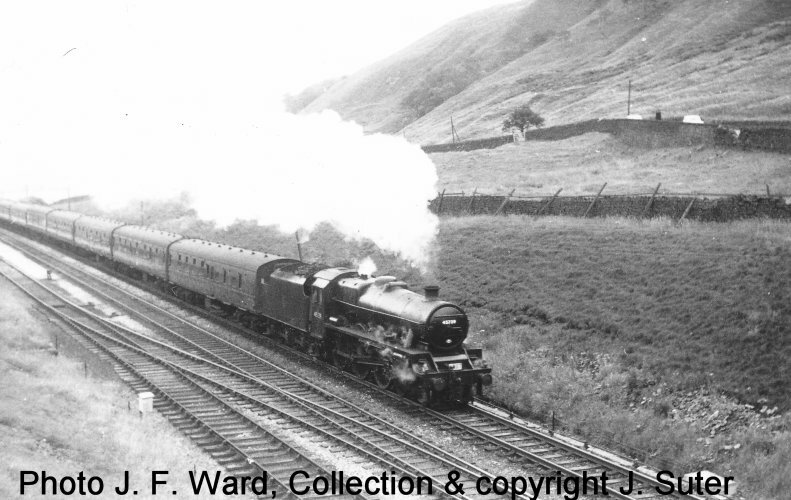 An up freight powered by 90412 and 42727 was recorded at various points between Kitson Wood Tunnel and the summit at Copy Pit, and the journey can be viewed here.